On Jan. 26, 1788, the First Fleet of British ships at Port Jackson, New South Wales, arrived and raised the flag of Great Britain at Sydney Cove. 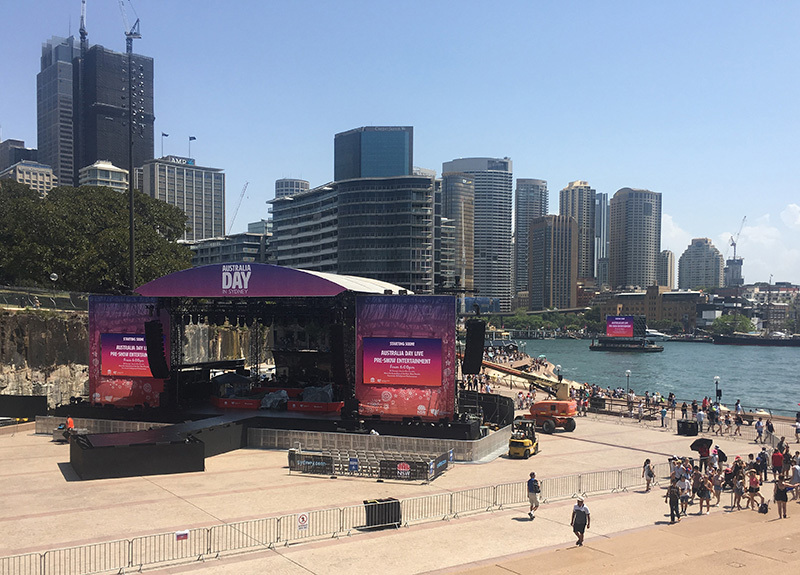 Pictured here is the setup for the 2019 celebration of Australia Day. 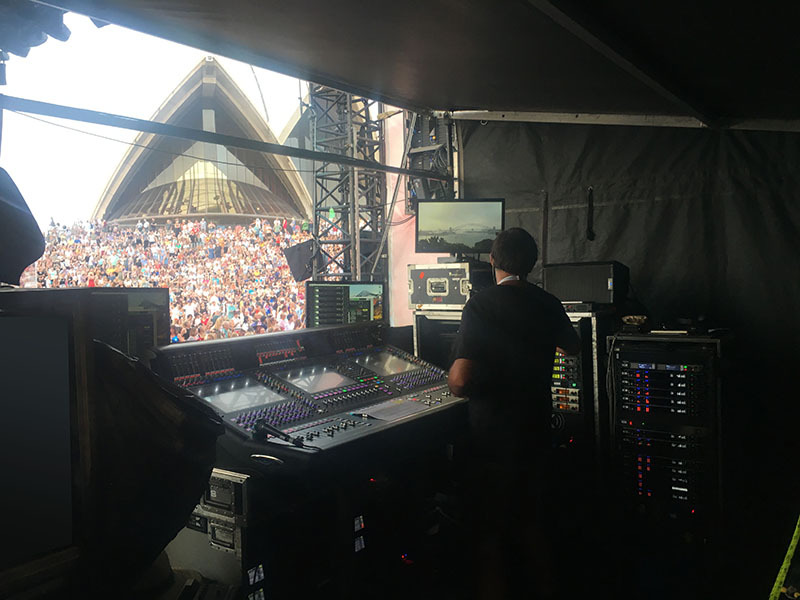 SYDNEY – Eighth Day Sound and Innovative Production Services teamed up with Shure wireless experts from Jands to support the audio needs for a variety of events taking place on Australia Day, Jan. 26, 2019. 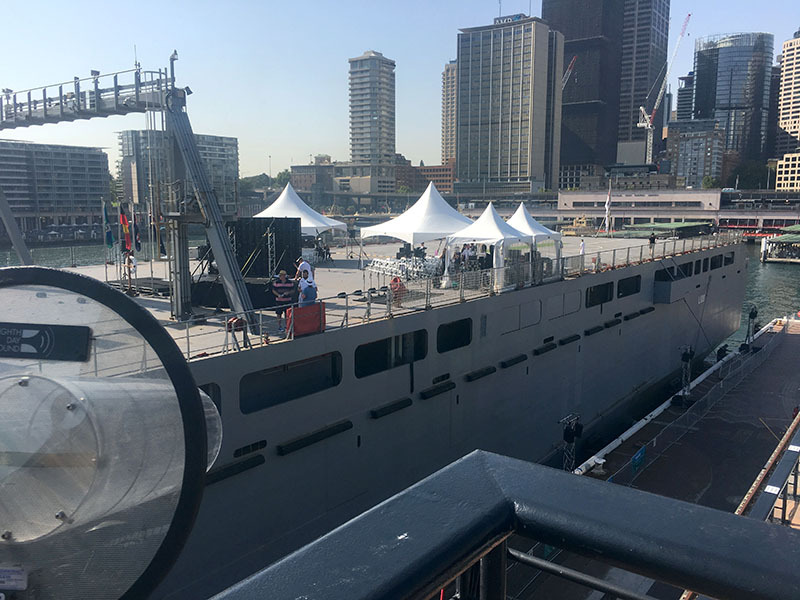 On January 26 2019, all around Warrane (Sydney Cove), solemnities, ceremonies, and performances took place to mark Australia Day. Starting off at 7:45 AM with a smoking ceremony at Walumil lawns, Barangaroo, a full program of events was staged at multiple sites, including a citizenship ceremony at Tallawoladah (Campbell’s Cove), the Governor General’s speech from the deck of the HMAS Choules moored in Circular Quay, and culminated in the Australia Day Live Concert broadcast by the ABC from the Forecourt of the Sydney Opera House. A massive production undertaking with incredibly demanding wireless channel counts, the celebrations ran flawlessly thanks to Shure Digital, superior frequency management, tight collaboration between production providers Eighth Day Sound and Innovative Production Services, and Shure wireless experts from Jands. Jands’ Peter Twartz handled wireless spectrum management across all sites on the day, working out of the main event control room at Circular Quay’s Overseas Passenger Terminal. With a fibre network linking all stages, three Shure Axient AXT600 Spectrum Management units deployed around the cove, and Shure’s Wireless Workbench software in his toolbox, Peter had total control and visibility of multiple wireless zones and dozens of devices from his laptop, no matter where he physically connected. Active channels on the Opera House Forecourt comprised 12 Axient Digital AD4D dual channel receivers paired with 16 AD2 handhelds and 8 AD1 bodypacks, and eight PSM 1000 dual channel personal monitor transmitters paired with 24 of its matching beltpacks. Tallawoladah was running six Axient Digital AD4D dual channel receivers with eight AD2 handhelds and four AD1 bodypacks. First Fleet Park ran two stages equipped with Shure ULX-D wireless mics. HMAS Choules carried four Shure UR4D receivers paired with four UR2 handheld transmitters and four UR1 bodypacks. Finally, a PSM 1000 personal monitor transmitter and two beltpacks ran out of the Overseas Passenger Terminal transmitting to a floating stage. 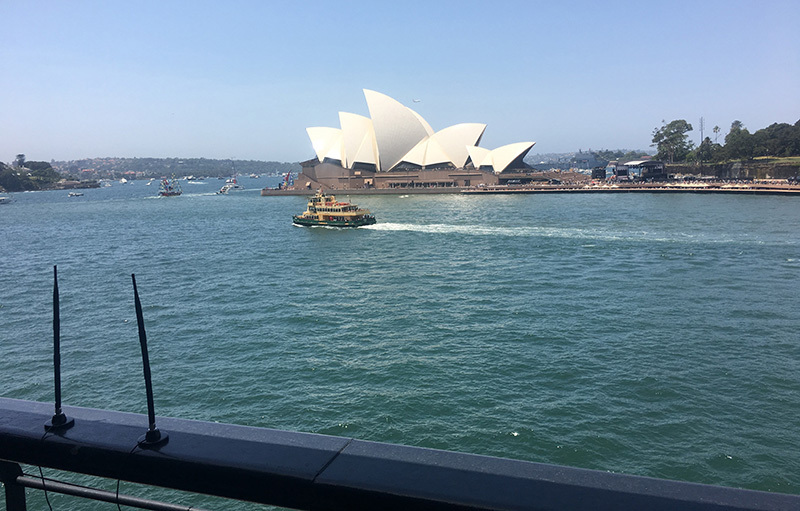 For the all-important live broadcast on the Opera House Forecourt, the hosts were fitted with Axient Digital ADX1 bodypack transmitters, whose ShowLink capabilities allow operators to monitor and control them remotely, including seamlessly changing level and frequency if necessary. Four channels of ADX ran with the receivers in Quadversity mode, receiving signal from two separate pairs of antennas, from which Axient automatically selects the strongest signal. This allowed the presenters to roam between wireless zones, an almost impossible task with any other RF equipment.